Road conditions to area - Damp. CalTrans at work 3 times. One mud/rock/snow slide. The Angeles Crest (Hwy 2) was moist the whole way up; no snow or ice on the road. CalTrans was out clearing mudslides in three places. There was one rock/mud/snow slide that covered an entire lane just past Kratka. It was cleaned up by the time I drove back. I opted to bypass Waterman and Kratka—both of which, when I passed by, had some of the regulars getting ready to enjoy their day too—for Mt Islip. I could see rime/ice in trees on above 7500 on S & SW aspects Waterman Mtn. Snow started 'sticking' around 6000' (the organizational camps turnout). Avy & Winston canyons were too bony to board or ski. Waterman and Kratka looked ridable/skiable, but...you know...bring yer rock-board/skis! They both looked fully covered but thin. The hwy was closed at Islip Saddle (6670'; 40ºF (5ºC); ≥6” of heavy snow at 10:30). I chose to skin out the hwy and up Little Jimmy fire road; minimizing exposure by avoiding the gully crossings on the trail. Shortly after I set out, I discovered CalTrans had plowed one lane from the other side of the closure (Vincent Gap) to the second to last turn before Islip saddle (just out of sight from the road closure). I ended up following some guy's XC ski track the whole way. The snow surface was melting so fast, it was hard to determine if his tracks were from this morning or yesterday. At 7000', looking at the scarp the plow left, I noticed graupel in the middle of an 8–9” snowpack. Above above and below the graupel was slush. Throughout the tour, solar radiation greatly affected the snowpack surface. Sunny spots were very slushy and slick. Shady spots had a crust that stuck to my wet skins. Small runnels (>5mm deep) were everywhere below 7500' indicating it probably rained/sleeted a little toward the end of the storm cycle. Poking around with a ski pole consistently showed a harder surface than what was underneath. 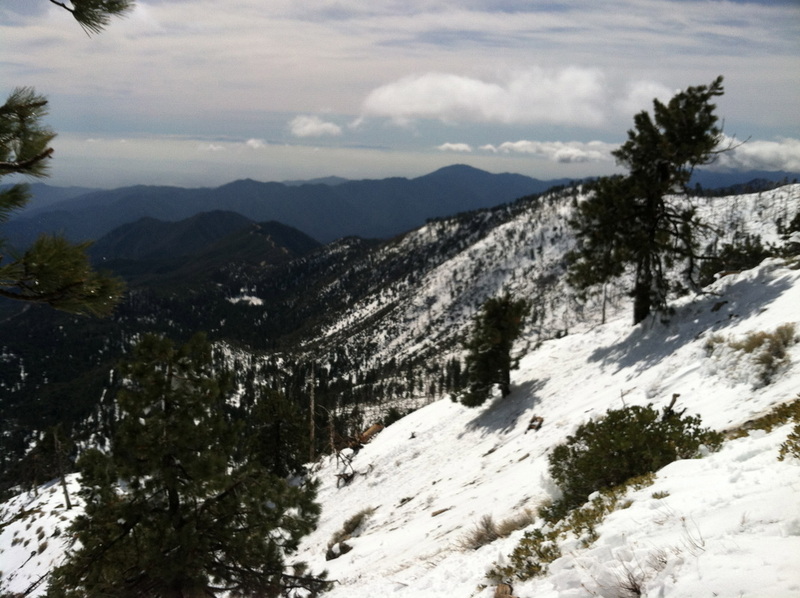 On the tour to the fire road, I hopped on a couple of test slopes (11:15–11:30): SCN38SW (6950'), SCN35N (7020'), SCN40E (7020'). Actually this last one is inconclusive because I fell. It was a 2.5m high slope above the hwy, in the shade. Within the first meter, I slipped on a 2cm thick crust which slid out from under me. Once I got up, subsequent bounces didn't produce any results. At noon it started heating up; 60ºF (16ºC) in flat open sections of the fire road. It very much became a dynamic environment with melting snow falling off trees, the snowpack turning to slush before my eyes, and rollerballs popping up everywhere. I thought this was the deathknell for my chance to snowboard at all today; especially when I saw that north-aspect catastrophic avy path from 2002 covered in rollerballs. All aspects had rollerballs on slopes > 45º & rock outcroppings. Pit: 12:45PM; 7,700'; 34.34°/-117.83°; NNW aspect; 35° slope; 30-35cm deep; Shaded portion of the slope. Profile from the ground up: 0–7cm hardness of 1F; 7–27cm 4F; 27–35cm 1F. Stability tests: CT15 @ ⇑25cm Q3 (measured from bottom). I could not replicate it on another (i.e. CTN); ECTN25 @ ⇑20 cm Q3. *Of note: the snowpack surface on sunny parts of the slope had hardness of 4F & F. **Of note: the talus was very moist and penetrable. Poking around with my probe, I initially thought I had 45cm of snow. I continued climbing to and up the ridge until 7920' where it was really warm and for the first time windy. However, the snow was too heavy to transport by wind at that time. I found a quickly-melting, proto-cornice on the ridge (1–2' higher than the snow level) and rime indicating wind from the SE. The rime was melting and falling in massive 6–9” chunks, making these huge thumps. Looking into Crystal Lake area I could see southerly aspect slopes were coming down quick. Snowslide Canyon (S & E aspect, un-treed) had...well...slid. The ride down was a pleasant surprise. I had a short 400' descent into camp on the same slope I dug the pit. It was smooth, mostly warm cream cheese with just a hint of crust...mmm. Once into camp, I transitioned my board back into skin mode and discovered my boots penetrating the slush up to mid-calf. Eek! The skin out was pleasant. By 1:30, Islip summit had become socked in. Where I was became partly cloudy, and the temps plummeted to ≈ 30ºF (-1ºC). At the trail/fire road junction, I really, really wanted to take the trail. It just looked so inviting and there-and-back trips are so lame. But I remembered hearing someone say, “When you tour solo, you have to be 100% correct 100% of the time” and thought of all those snails and sinking boots. *sigh* Alas, 'I shall stick with the fire road & hwy.' Besides, I didn't have to break trail that way. Large, old avy path with rollerballs. NE aspect.